Jack Kerouac was an icon for the Beat Generation of the 1950’s and early 1960’s. He became one of my son’s favorite authors and Kerouac’s novel, “On the Road” was considered the definitive work of the Beats. The painting was completed in near-monochromatic colors to evoke the strong appeal of the black and white photograph from which it was painted. 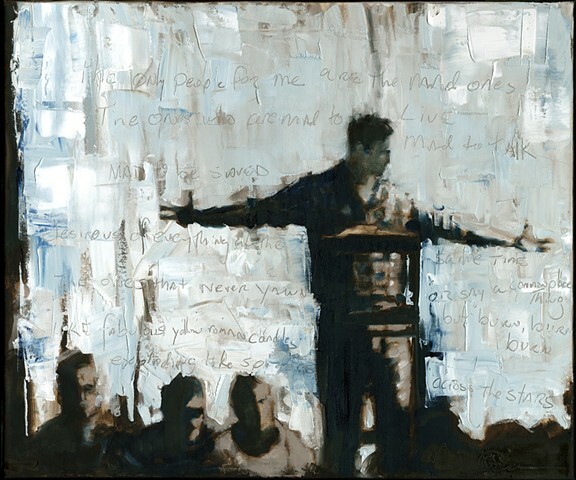 The composition was created with brush and pallet knife to give the image texture and mask the well-known excerpt from “On the Road” scratched into the background. The image is based on an archival photograph of Kerouac reciting his works at the City Lights Bookstore in San Francisco. Kerouac’s well-known friends and fellow cultural spirits Allen Ginsberg and Neal Cassady are represented to the immediate left of Kerouac’s figure.